Bestselling author A.J. Jacobs is no stranger to ambitious projects. In his 2008 book The Year of Living Biblically, Jacobs sought to live as closely to the rules of the bible as he could. 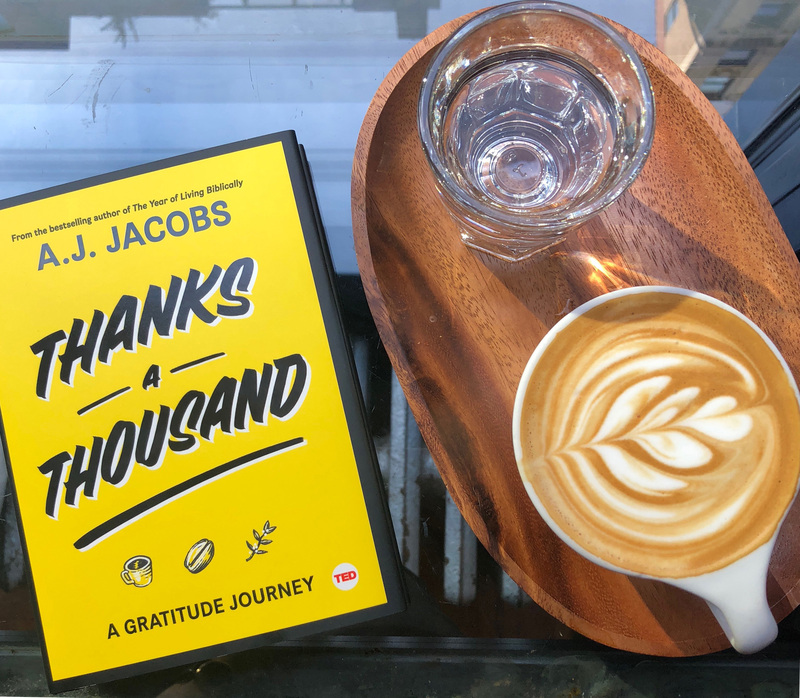 This month he releases his sixth title, Thanks a Thousand, which chronicles his gratitude journey for a single cup of coffee—which we’re happy to say, he purchased at Joe Coffee. We sat down with A.J. 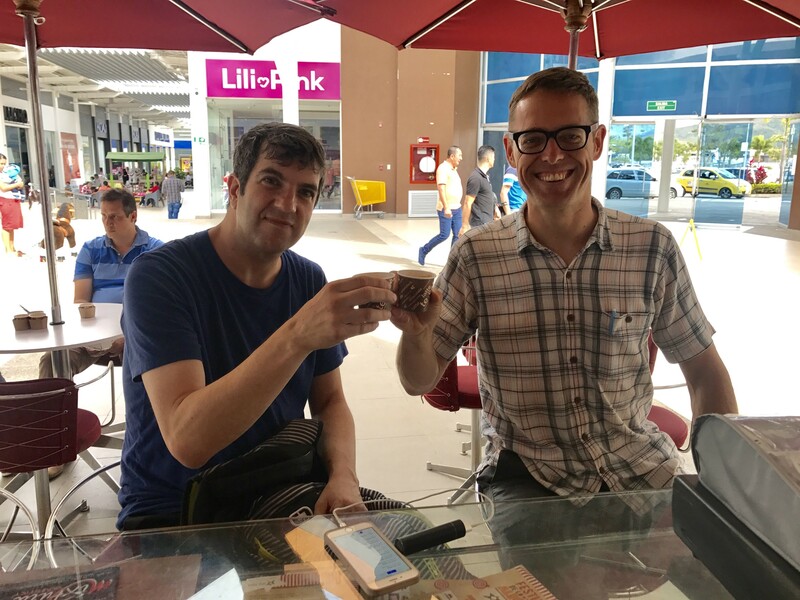 to learn how his project shaped how he thinks about both coffee and gratitude. Joe: What surprised you most about your coffee’s journey to you, or what seemed the most incredible thing about it? A.J. : Before I answer, let me just say a huge, overflowing thanks to the folks at Joe. They were so helpful and open, I couldn’t have asked for a better partner on this journey. The most surprising part was just how many people it takes for me to produce my morning cup of coffee at Joe. I knew about the farmer and the barista, of course. But there are hundreds of people in between. The tasters, the the roasters, the inspectors, the importing company, the trucker—and the trucker couldn’t do his job without the road, so I felt I should thank the folks who pave the road. And the folks who paint yellow lines on the road so the trucker doesn’t veer into oncoming traffic. As I say in the book: It doesn’t take a village to make a cup of coffee. It takes the world. A.J. with some of the Guarnizo brothers. 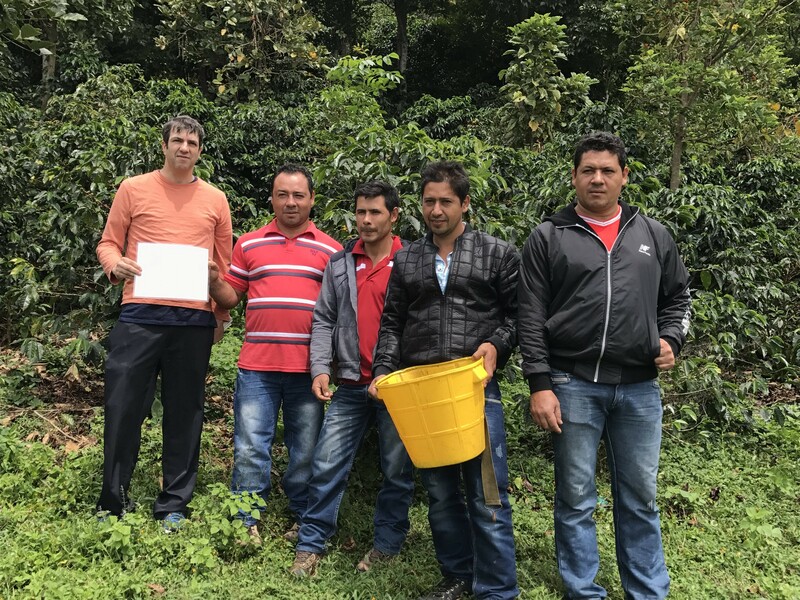 Were you aware of any difference between specialty coffee’s supply chain and that of, say, everyday diner coffee? Not nearly enough. 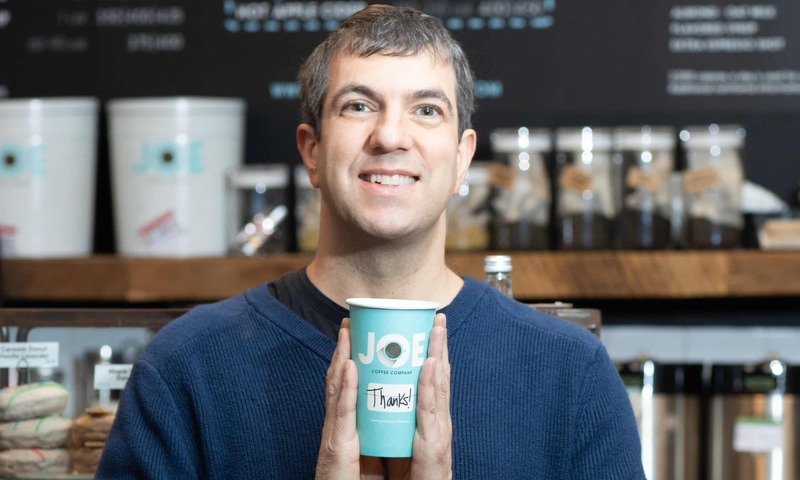 I was delighted by the amount of thought and passion that goes into every step of Joe Coffee. For instance, visiting the roastery in Brooklyn was an eye-opener. I love that there are gadgets to measure the moisture level of the beans, and another to measure the bean’s stability. And of course, I loved visiting the small Colombian family farm where some of my beans are grown. I like that it wasn’t a big mega-corporate farm. It was eight brothers and one sister. Do you think you would have had this same experience if you’d written about shoelaces instead of coffee? I could have done a gratitude journey about shoelaces, but it wouldn’t have been nearly as delicious. My kids wanted me to thank everyone involved in making their s’mores, because they figured it would increase the number of s’mores around the house. But I chose coffee because it’s my version of s’mores: A huge treat. You talked in your book a lot about how far to take the journey—and why you had to limit it to only 1000 thank-yous. Were there any people you felt were a stretch? My wife told me that thanking Beyonce was a stretch (I thanked her because her music kept the truck drivers awake as they drove the beans to the store). And maybe it was. But the point of the book is to embrace six degrees of gratitude. I wanted to show that thousands of people are involved in every little item in our lives, and we take those people for granted. Does it still feel like there are people you’ve omitted? Absolutely. I could have spent 50 years thanking all the people involved in the coffee chain. Plus, I sometimes put almond milk in my coffee (sorry Ed! I know you prefer it when I drink it straight up). So I could thank all the people on that chain too. I did get to thank the founder Jonathan Rubinstein, but I wish I’d had room to write a whole section on him. I love his passion for his customers and his coffee—not to mention all things Disney. Was there any one moment of thanking somebody on this journey that you felt made the most impact or had the most meaning in the other party’s life? 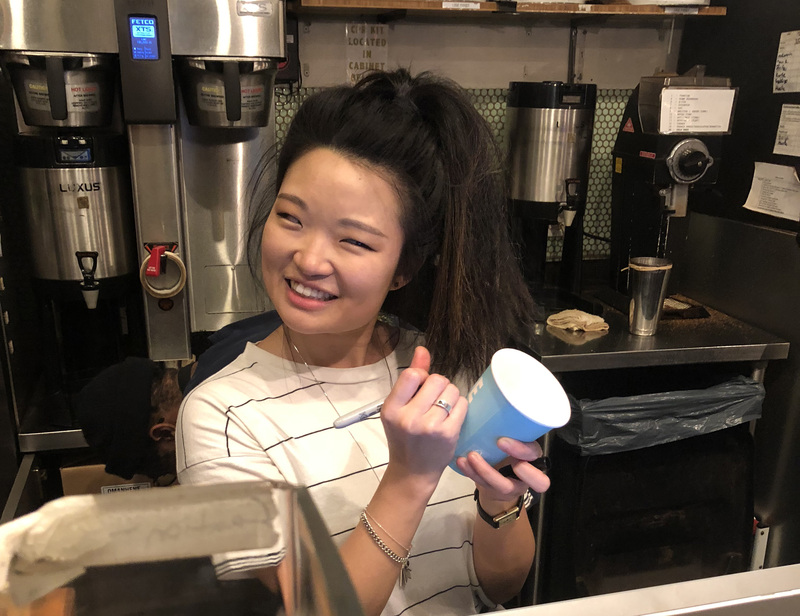 I don’t know if it had the most impact on her life, but I loved talking with barista Chung Lee. She said Joe Coffee clients are almost always friendly. But there are the occasional clients who place their orders without even looking up from their phones. They just hand over their credit card. They treat baristas like vending machines, not a humans. I realized I’ve been that jerk sometimes. So I’ve made a vow to always look people in the eye when dealing with them. It’s such a small thing, but it has such a huge impact on both parties. Humans were meant to connect face to face. I also remember calling the woman who does pest control for the warehouse where the coffee is stored. I said, “I know this sounds strange, but I want to thank you for keeping the bugs out of my coffee.” She said, “That is strange, but thank YOU. We don’t get a lot of appreciation around here.” I felt like it was an anti-crank phone call. I felt like I was doing penance for my obnoxious calls in high school. If you get a bad coffee somewhere—are you still just as grateful? Ha! Well, it depends. If I haven’t had any coffee that day, I try to be grateful for, say, airplane coffee. But it’s a much milder gratitude. It’s like a decaf version of gratitude, to use a coffee metaphor. Has your gratitude journey rubbed off on the people around you? I’ve gotten wonderful feedback from readers. I spend much of my day thanking readers who send me thank you notes for writing the book. The danger is that they will thank me for thanking them for thanking me. It could be an infinite loop. A.J.’s book Thanks a Thousand is out now on TED Books.